Neuron is a FM-Drumsynth module capable of a wide range of sounds from kicks to snares, cymbals to percussion. 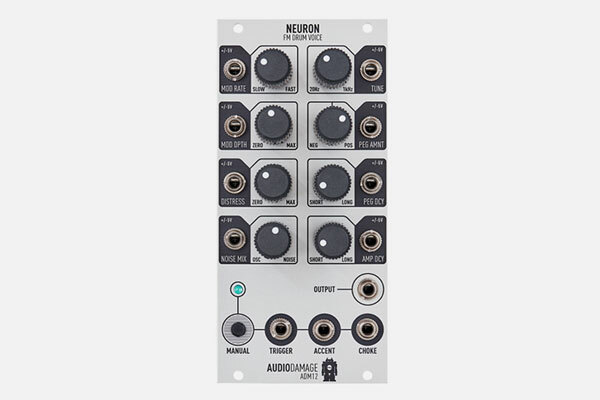 Neuron has a DSP-based 2 operator sound generator with modulation envelopes tailored towards percussive sounds. The carrier waveform is based on the basic waveform of the TR-909 bass drum. It can be modulated by a sinewave and distorted with Soft Saturation (Distress). The frequency range (tune) is from 20 Hz to 1 kHz. Furthermore the module has a true random-number-generator for white noise on board, making it easy to generate snares and Noise-kicks (similar to Simmons). There are inputs for trigger but also for accent and choke, allowing further control over the output. All of the eight functions come with a cv-in (+/-5 Volt). Firmware updates can be uploaded via a USB-port on the circuit board.